Rugged protection worthy of your truck. Carhartt Truck Covers, made from the same durable fabric as the hugely popular clothing line, creates a tough layer of defense for your truck. With a superior UV protection feature and outstanding dust protection, Carhartt Truck Covers are perfect for use both outside in the damaging sun, and undercover in your garage. The custom-made Carhartt Truck Cover is a perfect fit for your vehicle and the ultimate in rugged, durable protection. The Carhartt company made its debut in 1910 and was known for their durable clothing. More specifically, the durable fabric they used when creating their clothing. Their outerwear is famous in northern regions for its protection against the elements, and again, for the long life span of its fabric. Now just imagine all of those good qualities made into a truck cover for your vehicle! The fully customizable Carhartt Truck Cover fits your truck like a glove for ultimate protection from rain, UV rays, dust, salt, snow and any other damaging element. One of our customers swears he won’t go out to his job sites for extended periods of time without his Carhartt Truck Cover – the amount of dust, dirt, sand, and other construction site debris would kill his paint job! Proudly display the Carhartt name with your Carhartt Truck Cover! 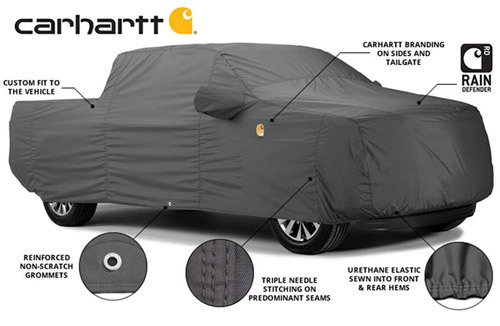 Forget all about those flimsy car covers you see in stores – the Carhartt Truck cover is made from a thick, ultra-protective fabric and reinforced with triple-needle stitching on the stress seams. Those specialized seams prevent stretching and loosening after repeated uses – fully extending the life of your Carhartt Truck Cover. Available in either Carhartt Brown or Carhartt Gravel, Carhartt Truck Covers proudly display the Carhartt logo on the front right corner and the Carhartt name across the tailgate – effectively telling the world that you know good quality craftsmanship when you see it and that you’re serious about your truck. With a whopping 4/5 Dust Protection rating, a 4/5 UV Protection rating, and a 4/5 Soft Touch rating, the Carhartt Truck Cover is perfect for use indoors in a garage, or outdoors. You’ll never have to worry about job site dust, harsh UV rays, or scratched and swirled paint from a car cover again! Custom truck covers ship directly from the manufacturer via ground service. Expedited and international shipping are not available.